Boots are more important than skis. In terms of their effect on every aspect of your skiing, boots are at least ten times more valuable than skis. Maybe more. I’m reiterating this primordial bit of advice because our seemingly ever-shrinking sport is seeing a bump in participation from an unexpected quarter: lapsed participants returning to Alpine skiing. It turns out there’s a substantial population of former skiers who dropped out ten to twenty years ago for all kinds of reasons who now find themselves at a new phase in life where skiing once again beckons. Every aspect of this return migration is positive, but it does raise a small nugget of concern. In a sense, the returnees are time-warped, their notions of what works for them frozen in memory’s amber. However much they knew about their gear in the misty past, almost every stitch of it is irrelevant today. Some of those recently reunited with the sport still have their old rig, and while they’ll be told gently but firmly that their old skis and bindings are past their useful life, the returnees may hold out a beacon of hope that their boots are still fine. The probability that a used, fifteen-year old boot is still a viable option hovers near zero. Whether you use it of not, plastic ages. (See Your Equipment Isn’t Getting Any Younger.) Even if you’re able to get the boots on – a big if – you’ll be handicapping your return to skiing when you could be assisting it. Jackson makes his living providing advice about skis. So why does he have boots on his mind? One of the most significant changes in equipment over the last twenty years is the subtle evolution of Alpine boots. To the untrained eye, they may look the same as their ancestors, but the quality of inner boot design and the variety of shell lasts now being offered provide skiers with far more viable options than existed when most of the dropouts began their self-imposed exile. One aspect of ski boot shopping that hasn’t changed is that it’s not a project you can do alone. Bootfitting is like any athletic endeavor in that if you want to do it well, you need a coach. You need a bootfitter, someone capable of matching a boot to you by ways and means you may not even know are possible. Here’s what you don’t need to do: study every boot extant to familiarize yourself with the current field of players. While it sounds suicidal for someone who vends ski information to diminish the value of reading reviews, the decision of which model works best for you rests largely with the bootfitter, not the bootfittee. Which is just as it should be. The value of a good bootfitter is not just that he or she can properly assess your foot and lower leg, but that he/she also knows every detail about every shell and liner on the wall. Great bootfitting also entails an understanding of basic skiing biomechanics and whether a given boot functionally matches not only the skier, but the ski(s) to which it will be mated. You aren’t going to know all of this, and if by some miracle you do, you should still submit to the care of a veteran bootfitter. Remember, even Tiger Woods has a coach. If you would like a deep-dive inspection of the current boot market, the only impeccable source is the Masterfit Boot Test. Test Director and boot review author Mark Elling rounds up a phalanx of testers and a roomful of every flagship boot model in a range of sizes. There is no more authoritative source on ski boots, period. 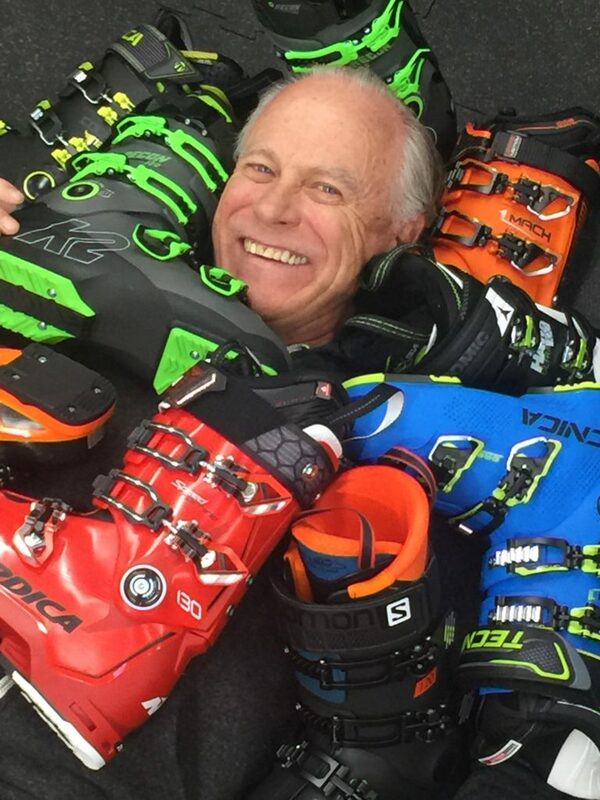 If you’d like to read a thumbnail portrait of each significant boot brand, both from an historical and current perspective, Boot Brand Profiles are posted each season on Realskiers.com. To catch up on just how a proper bootfit session ought to proceed, I refer you to The First Five Minutes. If you do decide to bone up on all the details of today’s boot market to the point where you feel sufficiently proficient to select the right boot on your own, hit the pause button. If you bought your last boots twenty years ago, you didn’t have the option of ordering them from a web site. Now you do. Please don’t. I don’t say this just to support the specialty shops where all the best bootfitters ply their trade, but to warn those who wade into these waters that their chances of getting all the details right while operating at a distance are astronomically small. To recite another boot shopping verity, you’re not looking for a boot, you’re looking for a bootfitter. To get you started on your search, I recommend two resources: Realskiers.com Test Shops and America’s Best Bootfitters. If buying all new gear is a budget killer, be advised there’s a robust market for used skis. While Internet shopping has its inherent perils, it’s a useful tool provided you know what you’re looking for. If you don’t want to buy skis until you have a better grasp of your options, you can rent or lease skis until you know what you want to own. A final note for the returning skier: The America’s Best Bootfitters.com and Realskiers.com Insiders’ Buyer’s Guide is an ideal resource for someone who’s been away from the sport for a spell. Coming soon to a digital bookshelf near you.